Spielbergs is a three-piece Indie Rock band from Oslo, in Norway. The line-up consists of Mads Baklien on vocals and guitar, Stien N. Brennskag on vocals and bass, and Christian on drums. For live gigs, Ole T. Hovig joins them to play the synthesiser. The first two have previously individually played in the groups Team Me, and Lukestar, and have now combined their talents for Spielbergs’ debut album, This Is Not the End, released by new label By The Time It Gets Dark. Apparently, Spielbergs love bands that aren’t afraid to be diverse within an album’s music, and that’s what we get here, to a point, with short and sweet Commercial Rock as well as longer, jamming tracks containing a lot more energy and something a little different. There is an overdriven fuzzy sound to the guitar which rocks-up what is quite a commercial opening with 'Five On It'. There is a low bass sound for 'Distant Star', although the hooks and chorus vocals are still in evidence. 'Not For Long' hinges on a repeated riff and bassline. It alternates between quieter and more full-on rock-out moments. 'We Are All Going To Die' was a popular single released before the album. The guitar- and drums-combined riff is simple but clever, driving the song and music. In places it reminds me of the style of Big Country, but with a Space Rock outro. 'Familiar' has Progressive Rock tendencies, sounding like it originates from the post Psychedelic to Rock era of the early 1970s. 'You All Look Like Giants' is another very bass-driven moderate but guitar overdriven song, to the extent that the vocals also sound fuzzy. 'Bad Friend' is, in my opinion, the best of the bunch here by far. Jaunty, with light and shade, nice guitar and drums melodies, drive and energy. It surely has to be a contender for the next single. 'Shades of Fastball', which is no bad thing. 'McDonalds (Please Don’t F**k Up My Order)' is not the type of song you expect. Rather than a jaunty, tongue-in-cheek exercise, we get a low and depressive mood. It’s nearly all instrumental, with a handful of words which are very low in the mix. 'Sleeper' is another song with throwbacks to the late sixties and early seventies hippy culture, with acoustic guitar and spaced-out vocals. '4AM' is a nice melodic but driven piece, with a simple chord sequence. 'S.K.' is a short, atmospheric introduction to the final track, 'Forevermore'. Shades of Big Country again; probably the bass sound. 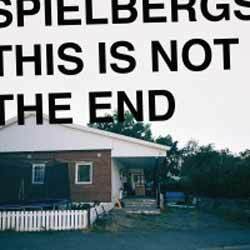 This is an enjoyable debut from Spielbergs. Not as diverse as they would have you believe, and some of the sounds are samey. But they are not afraid to make this offering raw and powerful, with feedback sometimes intruding on the guitar. I get the feeling they are doing what they want to do and not what others might want or expect. That is fine by me. It’s what every band should do.